It's October 31, 2016, and there are 61 days remaining until the end of this year. Remember next Sunday, November 6, to turn your clocks back an hour. And on Tuesday, November 8, don't forget to vote responsibly, or you could be turning the clock back 60 years. On this date in 1926, famed magician Harry Houdini died of gangrene and peritonitis that developed from a ruptured appendix, which was reportedly caused when a McGill University student unexpectedly punched Houdini in the abdomen several times in order to test Houdini's assertion that stomach punches could not hurt him. There's some doubt the assault ruptured the appendix; there's no clear relationship between blunt trauma and appendicitis. 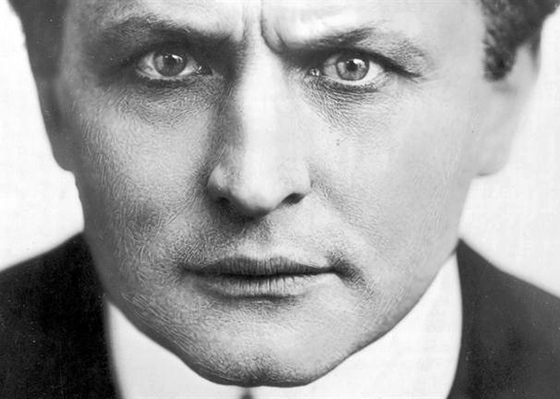 In any event, despite great pain and a high fever, Houdini waited several days before going to the hospital- the show must go on- resulting in a situation from which he could not escape. Among other things, today is National Knock Knock Day. Many credit Shakespeare with the first knock knock joke, which appears in Macbeth, Act 2, scene 3, the famous porter scene. If you live in Pittsburgh or western Pennsylvania, the cloudy part of the year arrived this past weekend. From now until around May 10, the median cloud cover is about 82%; that is, there are as many days with cloud cover of 82% or greater than days when it's clearer. Depending on what source you reference, Pittsburgh ranks as the second to fourth cloudiest city in the United States, cloudy being defined as cloud cover of 75% or more. We're a victim of geography, stuck between Lake Erie and the Laurel Highlands. And it doesn't mean we don't have days- or at least a few hours- when the skies are clear. That said, don't forget your take your Vitamin D supplement and use full spectrum light bulbs. The Tampa Bay Times checked in with 11 different Florida men... or "Florida Mans"... people who have been seduced by dolphins, who have punched swans, have been banned from ordering pizza by phone, fired a musket off an overpass while dressed as a pirate- you know, everyday Florida folk- to determine their preferences in the upcoming Presidential election. Hillary won, 7-4. You may interpret that in any manner you choose. Peter Jackson, New Zealand film director, screenwriter, film producer and actor; Chiang Kai-shek, Chinese political and military leader ; John Keats, an English Romantic poet; Michael Landon, American actor, writer, director, and producer; Juliette Gordon Low, founder of Girl Guides, later the Girl Scouts of the USA; Jane Pauley, American television journalist and author; Dan Rather, American journalist and the former anchor of the CBS Evening News; Neal Stephenson, American writer and game designer; and Ethel Waters, American blues, jazz and gospel singer and actress. I'm not going to post any links to the FBI/Anthony Weiner/Hillary Clinton trainwreck that happened last Friday. Let's be honest... no one's changing their opinion at this point, and I find myself agreeing with Bill Maher, who said on his show last Friday night, "She's got a server in her basement? I don't care if she has Jon-Benet Ramsey in her basement. I'm still not voting for Donald Trump." I know of nine people, including my wife, who had never voted before, who registered this year. They voted for Bernie in the primaries, and they're voting for Clinton next week. Well, to be honest, they registered so that they could vote against Donald Trump. One final thing... at this point, really, how can any undecided voters exist? I find myself agreeing with The Huffington Post on this one. Clinton took a bit of a hit over the weekend, but the website FiveThirtyEight says she has a 78.8% chance of winning at this point. AARP, of which, alas, I am a member, has sued the U.S. Equal Employment Opportunity Commission over rules for wellness programs run by some employers and their health insurers. The organization argues that the programs violate anti-discrimination laws aimed at protecting workers' medical information. It also questions whether the programs are truly voluntary when the price of not participating can be high- specifically, insurance premium increases of as much as 30%. Back in the '90s, a computer storage company ran an ad that said, "There are two kinds of users in the world: Those who have lost data and those who will lose data." Atlantic magazine did a test where they rented a small server from Amazon, configured it to look like an unsecured web device, and opened up a port to the Internet. The first hacker attack came 41 minutes later. Those wild and crazy guys over at the Society of Actuaries released a study that showed that the average life expectancy of Americans continues to deteriorate; it's about six months less than last year, and that includes millenials as well. Somewhat related, I stumbled over a segment of a comedy routine by Louis C.K., where he wonders why people always ask what happens after we die. Said Louie: "Actually, lots of things happen after you die- just none of it includes you." Since it is Halloween, when parents twist the paranoia dial to 11, it's good to remember the snopes.com study that showed police have never documented actual cases of people randomly distributing poisoned goodies to children on Halloween. There was a case in which a father poisoned his eight year old son with cyanide-laced Pixie Stix in order to collect on a large insurance policy. The father was found guilty and executed by lethal injection. Q. Should I be worried? A. If you haven’t already been horrified for the last 16 months, there’s probably no point in starting now. U.S. News and World Report continues its almost obsessive-compulsive tendency to rate things with an "overall best countries" ranking which places the US at #4, behind Germany, Canada, and the United Kingdom, but ahead of Sweden, Australia, and Japan. Australia could make the top position easily if they'd eliminate all their venomous creatures- and Vegemite.